Although they don't have any store in my immediate area, I'm always happy to give The Body Shop a visit when I come across one of their shops. There is something comforting about their body products, as they are so nice to use and so reliable. I also like to browse their makeup even if I don't own many of those products, but I did find some little gems in the past (particularly in the blusher section) so I am always happy to give their new products a look or a try. So I thought I would tell you about 2 little products that I currently love and use daily. The first one is the Olive Body Butter. I got a mini jar of it in a beauty box and at first I was a bit surprised by the idea of using olive - not that they're not rich and moisturizing, but because you'd think their scent is quite far from the usual sweet Body Shop body butters. I must admit I thought this would smell a bit like pesto. Well, not at all. Although the butter itself is definitely green (a nice peppermint green I would say), I don't find it smells of olives at all. In fact, it smells rather fresh, a bit like bamboo shower gel if that tells you something. So it's a really nice fresh smell that is very nice to use in the current heat. I know, I know, it might sound weird to use a body butter in the Summer. I should really do that in the Winter more, but I can't be bothered when my legs don't see daylight. But in Summer, I want everything to look moisturized and firm, and body butters are great for that, giving your skin a slight sheen that looks very healthy. Perfect for arms and legs! The second one is the All In One Concealer. I was sent this one to try by The Body Shop in the shade 01, which is the lightest and slightly pink/salmony in tone. I wasn't sure I would like it because I often find nothing compares to my Estee Lauder Double Wear, and also because it's not the kind of shade I usually go for. Again, I was pleasantly surprised. You actually see a different color in the center of the product, it's a bit like a two-in-one moisturizer and concealer. The whole formula is really emollient and easy to blend, but also lightweight. I would definitely recommend it to anyone with a dry undereye area, as it would be very comfortable to wear. 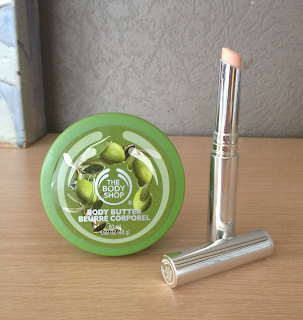 Despite the moisturizing ingredients, it doesn't slide around at all, I just set it very lightly with my face powder. The salmony color is surprisingly brightening. On good days I use it on its own, mainly on the inner and outer corners of the eyes. If I didn't sleep enough, I use a little bit of the Double Wear on top, but much less than when I use it on its own, and the All In One Concealer acts as a corrector - but with a much lighter texture than, say, the Bobbi Brown one. These two little products are going to stay with me this Summer. What are your favorite Body Shop products at this time of the year?